Established in 1979, ACS offers high quality courses for professional development and continued learning. We've educated thousands of full-time and part-time students, many of whom have gone onto successful employment, both in industry or in their own businesses. Why do students study with us? to pursue a specialist interest or lifestyle learning course. ACS firmly believes in the learner development which takes place through practical, hands-on education. ACS courses emphasise work and skills that are relevant to real life and workplace situations. ACS enables access to formal training in industry and the professions. 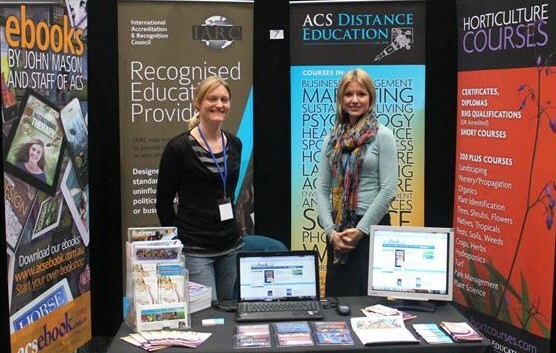 ACS Distance Education's in-house academic staff and our remote working tutors have always been active in industry. This has been a requirement of working with ACS. We know that maintaining an awareness of current information and trends enables us to keep our course notes and services to students up-to-date and relevant. When you study with ACS, you learn from people in the industry, specialists who are out working in your chosen field on a daily basis. Many of our teaching and learning staff hold relevant education qualifications and registrations. A key philosophy of ACS is that tutors will ideally be educated and hold tertiary level qualifications and be actively working in their industry disciplines. The result is students benefit from their tutor's professional experiences and up-to-date knowledge every step of the way. Hold a tertiary qualification (diploma or degree). Have a minimum of 5 years of industry experience. Hold an appropriate training skills qualification. Are still working in industry (at least part-time). We endeavor to employ tutors who have distinguished themselves as leaders in their respective fields. Current staff include former presidents and secretaries from professional associations, former and current managers and department heads from a variety of organisations (both private enterprise and government) and successful owner-operators of a wide variety of businesses. ACS was founded by the current Principal, John Mason. Mr Mason is a widely-published international author of more than 125 books and thousands of articles. He is a well-known and respected academic in his original field of horticulture, in both Australia and the United Kingdom. Mr Mason remains as active as ever in industry - he is a fellow of the Australian Institute of Horticulture and a fellow of the Chartered Institute of Horticulture in the UK. Mr Mason is also a Board Member of the peak industry body, The Australian Garden Council. Click here for more information on ACS staff. are struggling to build good study habits and confidence. Listening to and hearing your concerns and feedback, so we can provide the best experience possible. ACS academics are continually hard at work, researching and writing new books, magazine articles and video scripts. Regular check-ins with our staff. We encourage feedback from students through newsletter questionnaires, and contact with tutors. FLEXIBILITY — STUDY WHEN YOU WANT, HOW YOU WANT. If your studies are supported by someone else , they may require you to finish within a specified period. In such cases check with the supporting agency before enrolling. The task of choosing a course can be daunting. At ACS, we believe in non-traditional pathways. We listen to our students as much as possible, because everyone's learning journey is different. If you need further information get in touch with us for further advice or information. As you complete written & practical assignments, submit your work to the school for comment. Your tutor provides guidance where needed, and the work is returned to you to keep. A workplace project may involve developing and undertaking a research project in liaison with a tutor. A typical project will involve a series of communications (by phone, fax, email or in person), interspersed with periods of work and preparation of written reports. Yes, we have the 2-payment option for our 100-hour short courses and more installment options for Specialist Awards and Certificates. Please refer to the individual course pages. What happens if I need to take a break from studying through illness, parental leave, work commitments etc. You simply let us know! It's okay to take a break and start up your study at a later point in time, please just keep us posted. Call or email our student services team at [email protected]. We're always here to help. How long does a 100-hour course take to complete? Generally, 6 months to 1 year. We measure our course duration in hours to fit in with our students' need for flexibility. You can start your course anywhere, any time. There are no set assignment due dates, terms or semesters. You pace yourself, so if you can study a lot in one week, but not so much the next, that’s fine. You manage your own workload. How does recognition of the school compare with other colleges? We have focused more on giving our students those things that industry wants; and seeking support from industry and international recognition; rather than local or national government accreditation. At ACS, we focus on developing your learning. We aim to improve your capacity to function and grow within the discipline you study well into the future, so you can continue learning after you leave us. We have an outstanding success rate with graduates. It is rare to find graduates who do not excel in the rest of their journey. It's important to understand, though, that success is about more than study. To succeed, you need to be proactive and passionate about your work. Look for areas that suit your natural strengths. We encourage every prospective student to speak with our staff and explore the study possibilities before enrolling. This will help you visualise potential pathways and opportunities, and help us ensure your chosen course is a good fit. What do I get as a student? Our courses are quality learning experiences designed and delivered by experts to make you a more knowledgeable, aware and more capable person. If a course serves its purpose you will graduate with a different mindset, and a new perspective on the subject matter. As a student, we provide you with course notes and resources, and help you learn how to research and locate new material. We also encourage you to broaden your experience and regularly reflect on your learning. We believe an important part of this whole learning process is to provide support, which is why we include generous access to academic specialists who can guide and mentor you as needed. Your fees are paying not only for a set of notes but for a whole process of learning to be designed, maintained and supported by having resources standing ready to support you whenever we feel you are straying off course, or whenever you approach us seeking assistance. What are you waiting for? Make the decision that could change your life... enrol with ACS Distance Education today.